How quickly time passes… I feel like it was only yesterday that we were taking a tiny baby H to the mountains for the first time! We decided to head back to Lake Louise to get a photo of baby H at 31 weeks old… to compare with my 31 week belly shot! It turned out to be a slightly different trip than last time. Packing up our gear we headed off… right at H’s nap-time… did she nap… eventually. It did take a certain amount of singing and my arm reached around, so she could hold a finger, before she passed out! We stopped in Banff at our absolute favourite restaurant for a great lunch. It was busy and it was baby H’s first time in a restaurant high chair… she rocked it! I had brought a little dish of baby food (spinach, pears and strawberries), which I added a little bit of baby oatmeal cereal to and then realized… I forgot a bib! So I tucked a little washcloth, I had in my diaper bag, under one of her many chins… and we were good to go! She ate like a champ… sure it took a while, as she needed to smile at everyone who passed her… but she was awesome! After so much action in the very full restaurant munchkin passed right out! Our next stop was Lake Louise. Arriving at the Lake we bundled H up in her little bear suit and I decided to wear her in our carrier and off we went. The amounts of comments we got was fairly ridiculous… but she was bloody adorable, so I don’t blame anyone for the need to oooh and ahhh over the baby bear. It was then time to get the baby bear home before she turned into a grumpy bear. She was rather loud on her the way back, chatting up a storm, trying to play peek-a-boo through her mirror at us… but finally she had another nap and we made it home just in time for dinner, a little play and bed! Take your time! Seriously I learn this every time I go somewhere new with babe… but it never gets less important! Whether it is time to feed, change or simply get the little one out of the car seat it is so important to not be in a rush. Be flexible… if H had fallen asleep right when we wanted to go for lunch we might have done things a little differently. She is still in the car seat that clips into her stroller so we would have probably tried to get her to her stroller and then gone somewhere a bit calmer. Why do they even make baby outfit without ears?!? Traveling with a baby can be tricky and these are great tips! Thanks so much! I hope that my experiences help others get out there! Amazing post! The pictures are great! I bet this place is breathtaking! Thanks so much! It is so lovely… I just wish the lighting had been better! Love picture of little one sitting in snow. Fun to go back make more memories. Thanks so much! I can’t wait to go back in the summer… then you can really see how beautiful the lake is! Great tips! Having an infant on a trip for the first time an be quite an experience! It can be stressful, but it’s worth it! I love the care essentials list! So great. There’s that fine line between packing too much, and not having the things you need when it comes to little ones! I can’t wait to get back to the Lake when it is summer! It is so beautiful! I have always wanted to go to Lake Louise and now thanks to you, I feel like I was there! Great tips! Thanks! I am so lucky it is so close! Time passes so quickly, I can tell, not so long ago I was thinking about how to take care of my children and now they have already left the nest! So true… you find yourself hoping they reach the next milestone and then you realize… wait! Slow down… you are growing up so fast! My husband travels to Calgary often for business and last year I got to travel with him – in July and in November so I got to see Lake Louise and Banff with and without snow. Both times were absolutely breathtaking. 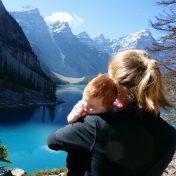 I love your photos – especially the last one with your little one sitting in the middle of the lake – too cute! Thanks! I know my photos don’t do it justice so I am glad you know how beautiful it is first hand! I had really big muscles when I was lugging around a baby and all that gear! Not so much now, but it’s probably the only thing I don’t miss about tiny ones. Haha that’s a positive way to think about it!